Remember not to brush hair when its wet! Hair is fragile when its wet so blot hair, instead of rubbing dry. 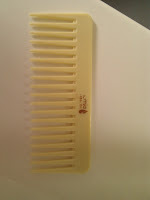 Then use a wide tooth comb to detangle, not a brush. i always manage to lose my combs so i rarely brush my hair now... It doesn't look too bad but it's very knotty! If you have tangled hair try O&M No Knott Conditioning Detangler. I haven't tried it, but have heard AMAZING things about it. I've order some, but am waiting for the postman to deliver it :) I was going to write a blog post about it once I've tried it out.